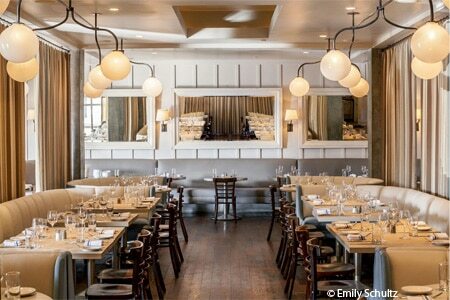 Southern fare gets the royal treatment without ever losing its authenticity at this dynamic establishment. Lunch Mon.-Sat., Dinner nightly, Bar Tues.-Sat. Entertainment: Live music in the bar Thurs.-Sat. : Chef Ford Fry’s line-up of restaurants launched with JCT. Kitchen & Bar, where Fry installed former sous chef Brian Horn as the executive chef. The kitchen turns out heaps of fried chicken; properly prepared, the bird is first brined and then soaked in buttermilk before being coated and fried. Meanwhile, stone-ground grits from Red Mule near Athens, Georgia, underpin the shrimp and grits, the specific preparation for which varies with the seasons. Deviled eggs, fried oysters and other regional dishes are additional options. Similarly seasonally driven are desserts. We prefer any that are fruit-based, such as caramel apple cake made with Georgia apples. Wines and beers are sourced worldwide; local brew labels include Red Hare, SweetWater and Terrapin. As for wine, there are unusual varietals and off-beat regions scattered throughout the selections. Check out the nice section of dessert wines, too. Sunday supper ($26 per person) presents a plate of deviled eggs and biscuits followed by a salad; the meat and three sides are chosen for the table. Note: The place can get quite loud when full.